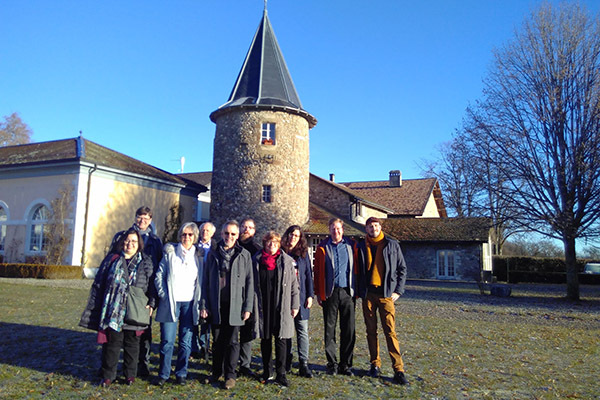 Under the leadership of Ursula Thomé, Ekkehard Lagoda and Claudio Gnypek, a total of nine pastors, one deacon and one religion and mathematics teacher travelled to Bossey in the context of a further education session of the Pastoral College in order to get an overview of the current work of the WCC. The focus was, among other things, on encountering the students – each year about 30 students complete the Institute’s two-semester, graduate-level “Master of Advanced Studies in Ecumenical Studies”. And the classroom is not the only place that people of different backgrounds and church traditions – Protestant, Roman Catholic, Orthodox, from India, Nigeria and the Congo or Armenia – come together; in Bossey they find themselves encountering others in ways that they might not have reckoned with. "In Bossey I have discovered that difference is possible," reported one of the MA students who works as an Anglican deacon in a college in his home country of Nigeria. An Orthodox student, a monk from Rumania, summarized his time in Bossey in this way: "It's a beautiful, but also challenging experience." "The gift of Bossey" was that very different people from throughout the world came here and attempted to live as a family, he noted. "And it's not easy, like in every family, but we try to overcome the differences." "To overcome the differences" together – all the differences of background, culture and church tradition, and also religion – is what Rev. Dr Joan Sauca, Director of the Ecumenical Institute and Romanian Orthodox theologian, promotes. It was primarily a question of trust, Sauca said, but trust could only grow when you knew exactly where you stood with your counterpart. Talking to the Institute Director it quickly became clear: Presenting an unclear, ever-changing picture of oneself based on a false understanding of tolerance hinders rather than helps true relationship. It is much more effective to present a true picture of yourself so that no one can suspect you of having a “hidden agenda”. What was important was an “open identity”, Sauca said, and then it would become clear that "at the end of the day we're all Christians". In Bossey it’s possible to experience this in full, with often far-reaching consequences. The Director knows: "Bossey is a life changing experience”. Listening to all this quickly raised the question of what is meant by the term “mission”. The visitors discussed this with Benjamin Simon who underlined, “It is important to me to rehabilitate the term. And to fill it differently.” This is because the term still can be interpreted very differently. Mission is not about conversation, according to Simon. Instead it is made up of three pillars – transmission, translation and transformation. The first pillar is about the capacity to articulate and give testimony of one’s faith. The second emphasizes above all a contextual understanding, and the latter means changing the present world and its structures, according to Simon. “Mission turns our lives upside down.” It is about making a contribution to bringing about the Kingdom of God – and to remain contextually rooted in doing so, not losing sight of any differences of tradition, background and cultural. In order to develop a sense for and understanding of such differences, the Ecumenical Institute of Bossey offers what is called a “Summer School” in addition to its year-long Master program. For three weeks in July and August, up to 20 students from throughout the world have the opportunity to combine enjoying the beauty of Bossey on the shores of Lake Geneva with an in-depth experience of living and working together at the Institute. The Summer School offers an introduction to the three Abrahamic religions and a thematical focus and concludes with a written essay. The most significant and fundamental experience, however, was learning how diverse Christianity was, underlined Simon, who is also responsible for the Summer School. An encounter with Dr Ani Ghazaryan Drissi, WCC Programme Executive for Faith and Order, offered a unique perspective on diversity. Drissi comes from the tradition of the Armenian Orthodox Church. She introduced the often highly complex Armenian Apostolic perspective within the ecumenical movement. "Being Christian in Armenia is an identity," she emphasized. The ordination of women, recognition of homosexuality and celebration of the Eucharist are points that even today have not been fully resolved with regard to life together and church dialogue. Drissi underlined the significance of the WCC in this context. "It's extremely important to have a body [where the churches can] connect," said the trained theologian, who cannot be ordained in her church and who, despite her education and experience, as a woman cannot participate in official dialogues. Thus, the WCC is even more important, says Drissi. "The WCC is the space to bring the churches together." As well as respectful dialogue, the WCC is also definitely a space to pray and worship together – and to recognize difference and tradition. "Pray[ing] together, worship[ing] together is very important - but by accepting all traditions." Overcoming differences together, showing an open identity, seeking respectful dialogue while honoring different traditions – all of these principles of the ecumenical movement and of ecumenical encounter connect with that which Rev. Dr Katalina Tahaafe-Williams, WCC Programme Executive for Mission and Evangelism from Tonga and Australia, calls and passionately promotes as “mission from the margins”. The term means that every international dialogue needs to be inspired by life on the margins. There has been up until now more of a movement and thought process out to the margins, for example from Europe to the global South. With “mission from the margins”, the aim is to take into account people living on the margins and to make clear that they have much to give and do not need to have things brought to them from the center. Rather, injustice could be transformed by starting from the margins, Williams said. "No matter how poor people are, we have to treat them as people who have something to offer." The idea is to share experiences authentically, to listen to one another and not to act as if there is only party who has the know-how to solve problems. For Williams, “mission form the margins” is above all a practical perspective, an approach and an “awareness for the needs” of people on the margins – so that true encounter and a common further journey on the ecumenical path can even be possible.